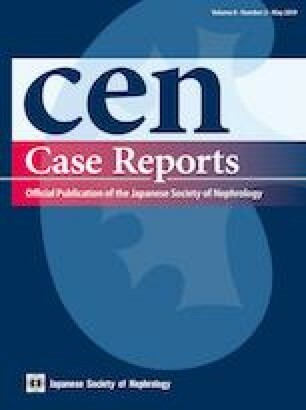 We herein report two cases of advanced stage rapidly progressive diabetic nephropathy that were effectively treated with combination therapy including renin–angiotensin–aldosterone system (RAS) blocker [angiotensin II receptor blocker (ARB)], glucagon-like peptide-1 (GLP-1) receptor agonist and sodium glucose transporter-2 (SGLT-2) inhibitor. A 30-year-old woman with advanced stage diabetic nephropathy [estimated glomerular filtration rate (eGFR): 20.7 mL/min/1.73 m2; proteinuria: 13.2 g/gCr], showing a rapidly progressive pattern (annual eGFR change: − 60.0 mL/min/1.73 m2/year), had improvement in proteinuria (5.9 g/gCr) and eGFR change (+ 4.3 mL/min/1.73 m2 over 15 weeks) after administration of ARB (irbesartan 25 mg/day), GLP-1 receptor agonist (liraglutide 0.3 mg/day) and SGLT-2 inhibitor (canagliflozin 50 mg/day). A 59-year-old man with advanced stage diabetic nephropathy (eGFR: 32.4 mL/min/1.73 m2; proteinuria: 8.90 g/gCr), showing a rapidly progressive pattern (annual eGFR change: − 21.2 mL/min/1.73 m2/year), had an improvement in proteinuria (0.02 g/gCr) and annual eGFR change (+ 0.1 mL/min/1.73 m2/year) after combination therapy with ARB (olmesartan 40 mg/day), GLP-1 receptor agonist (liraglutide 0.9 mg/day) and SGLT-2 inhibitor (tofogliflozin 10 mg/day). These results suggest that this triple combination therapy has renoprotective effects on advanced stage rapidly progressive diabetic nephropathy. Informed consent was obtained from the patients in these case reports.